Arterial blood supply deficiency and venous congestion both play a role in anastomotic complications. Our aim was to evaluate a software-based analysis of the fluorescence signal to recognize the patterns of bowel ischemia. In 18 pigs, two clips were applied on the inferior mesenteric artery (group A: n = 6) or vein (group V: n = 6) or on both (group A–V: n = 6). Three regions of interest (ROIs) were identified on the sigmoid: P = proximal to the first clip; C = central, between the two clips; and D = distal to the second clip. Indocyanine Green was injected intravenously. The fluorescence signal was captured by means of a near-infrared laparoscope. The time-to-peak (seconds) and the maximum fluorescence intensity were recorded using software. A normalized fluorescence intensity unit (NFIU: 0-to-1) was attributed, using a reference card. The NFIU’s over-time variations were computed every 10 min for 50 min. Capillary lactates were measured on the sigmoid at the 3 ROIs. Various machine learning algorithms were applied for ischemia patterns recognition. The time-to-peak at the ischemic ROI C was significantly longer in group A versus V (20.1 ± 13 vs. 8.43 ± 3.7; p = 0.04) and in group A–V versus V (20.71 ± 11.6 vs. 8.43 ± 3.7; p = 0.03). The maximal NIFU at ROI C, was higher in the V group (1.01 ± 0.21) when compared to A (0.61 ± 0.11; p = 0.002) and A–V (0.41 ± 0.2; p = 0.0005). Capillary lactates at ROI C were lower in V (1.3 ± 0.6) than in A (1.9 ± 0.5; p = 0.0071), and A–V (2.6 ± 1.5; p = 0.034). The K nearest neighbor and the Linear SVM algorithms provided both an accuracy of 75% in discriminating between A versus V and 85% in discriminating A versus A–V. The accuracy dropped to 70% when the ML had to identify the ROI and the type of ischemia simultaneously. The computer-assisted dynamic analysis of the fluorescence signal enables the discrimination between different bowel ischemia models. 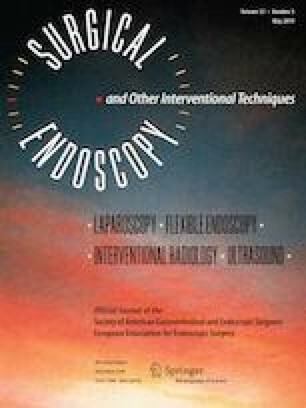 This work was partly presented during the Instrumentation/Devices/Technologies Session (S054) at the 16th World Congress of Endoscopic Surgery, jointly hosted by SAGES & CAGS held in Seattle, WA, April 11–14, 2018. A correction to this article is available online at https://doi.org/10.1007/s00464-019-06795-x. Authors are grateful to Christopher Burel, professional in Medical English proofreading for his assistance with the manuscript revision. This study was funded by the ARC Foundation for Cancer Research, a French foundation entirely dedicated to cancer research, in the framework of a large project (ELIOS: Endoscopic Luminescent Imaging for precision Oncologic Surgery) aiming at the development of fluorescence-guided surgery. https://www.fondation-arc.org/projets/ameliorer-diagnostic-et-traitement-chirurgical-cancers-digestifs. Michele Diana is the recipient of the ELIOS grant from the ARC foundation. Jacques Marescaux is the President of both IRCAD and IHU-Strasbourg Institutes, which are partly funded by Karl Storz, Medtronic and Siemens Healthcare. Giuseppe Quero, Alfonso Lapergola, Manuel Barberio, Barbara Seeliger, Ines Gockel, Paola Saccomandi, Ludovica Guierriero, Didier Mutter, Alend Saadi, Marc Worreth and Vincent Agnus have no conflicts of interest or financial ties to disclose.